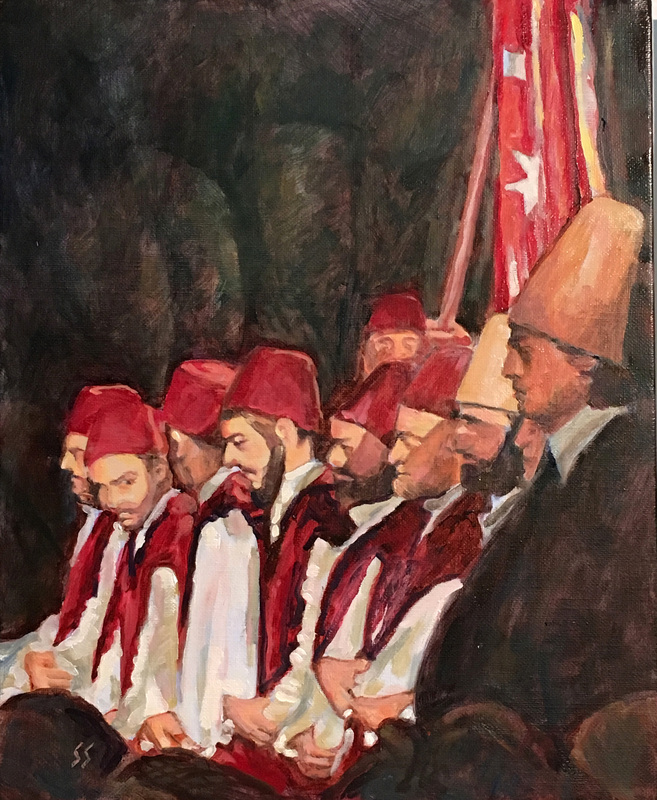 Turkish Sufi Performance Oil Painting Finished! 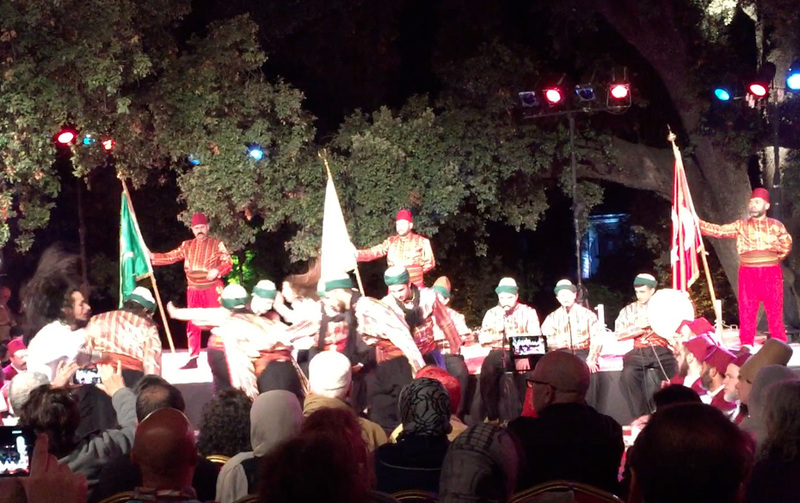 While working as a Montessori consultant in Morocco in the spring of 2015, I was fortunate to be present at a Performance of Sufi dancers and singers from Turkey. I was captured by the intense expressions of the men, especially the singers. It was this experience that inspired this painting. Here is a photograph of the whole performance. You can see the singers from the painting in the lower right hand corner. Below is an i-phone short video. As you watch the passion of the dancers and singers I think you will understand the inspiration for this painting. The painting has been sold as a result of this blog post. Since more than one person wanted it and there is of course only one original oil painting I am having giclees on canvas made. If you are interested in this let me know. Above is a picture of me with the children of the owners of this school. Since I always want to learn everything I can about a country in order to be a good consultant I was invited to join the family for a week of school vacation exploring their culture throughout the country. 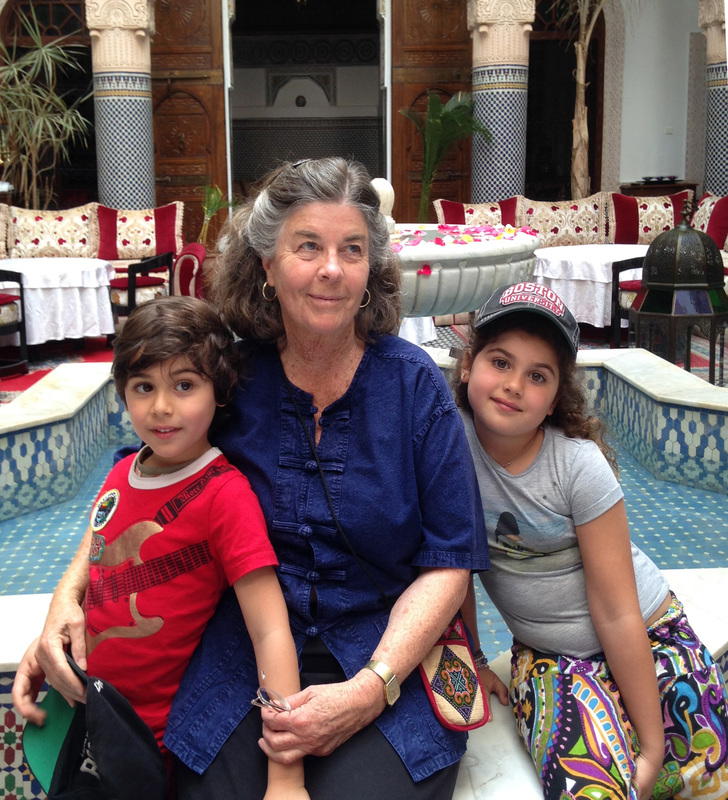 Here we are sitting on the edge of a fountain in a “riad” (traditional house) in the “medina” (old city) of Fez. We explored the medina for hours. 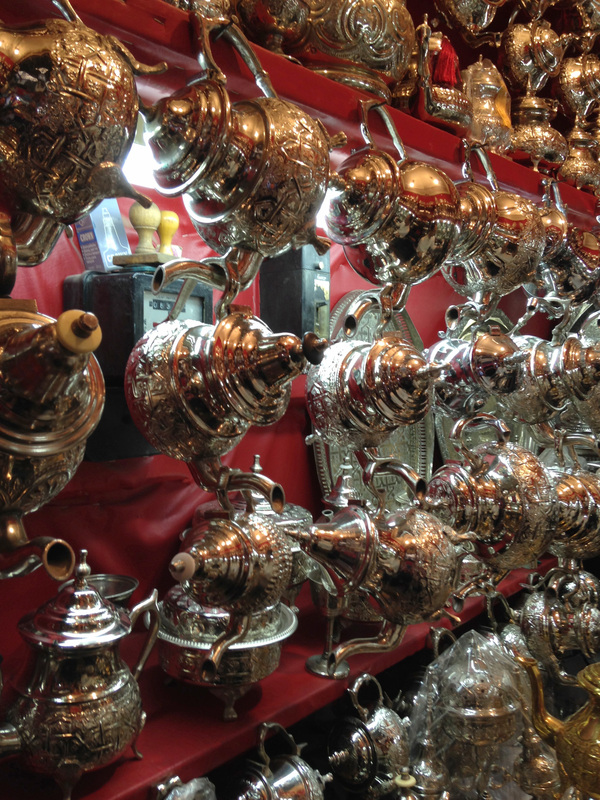 Here is a little shop where I found a traditional tea-pot to bring home. 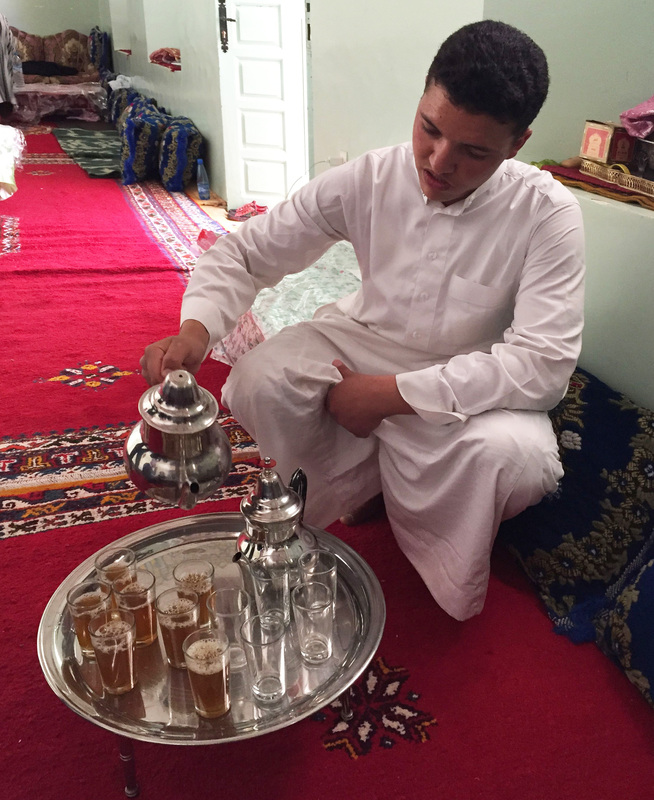 The cook at the Montessori school taught me how to make proper Moroccan mint tea. I have found the correct mint at the farmer’s market here in California, and am practicing? What, practicing you say? Yes, it is not that simple. After boiling the tea, sugar, mint for the proper time, as it is poured into the glasses, the teapot is gradually raised to a height of up to 2 feet, aerating and flavoring the tea. In this picture tea is being poured for us at a school for poor mountain children as the family and I accompany the volunteer eye-doctors for their annual volunteer work, and tell them about Montessori. 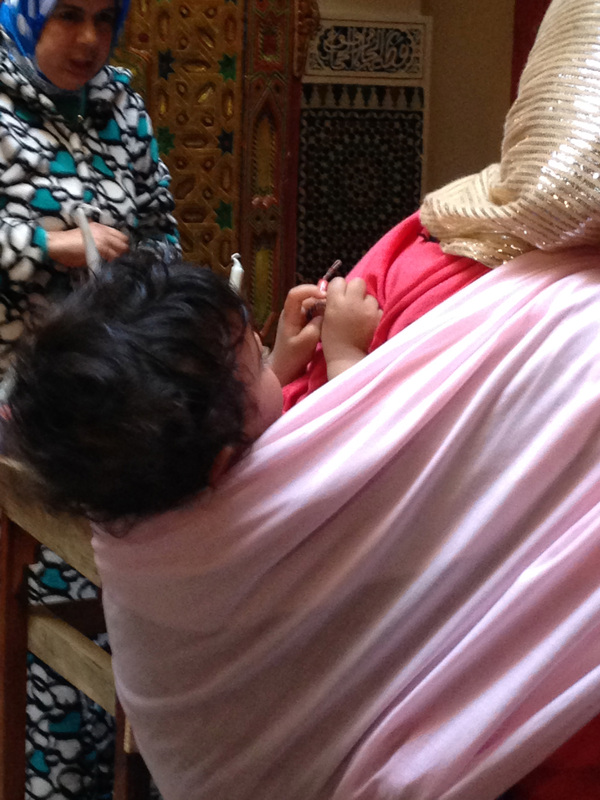 The beautiful traditional arts of Morocco are being kept alive and passed on the next generation. 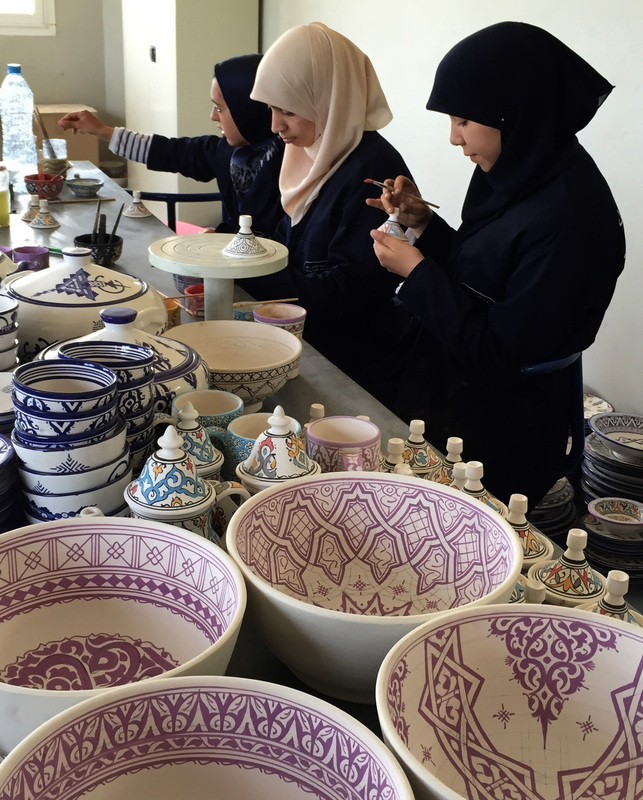 Pottery, mosaics, metal work, carpets. Above is a workshop/school in Fez. As always, I am constantly exploring the way young children are treated, cared for, and educated – in homes, schools, in the market, on the street. This child is being carried on her mother’s back, but given something to explore with her hand when she tires of the amazing visual exploration of the market! And as you can see, there is plenty to explore visually! The traditional way of sitting on the floor to eat, here and many places where I work, is very good for young children because they can join the adults at a very early age and it gives the child just what he wants, practice in using his hands to serve himself. It is so nice to be in places where no one would dream of watching TV, texting, talking on a phone, or reading during a meal. Because of this a meal is truly a social event, relaxing, and comforting. It really seemed to me that when the conversation was about the food, every bite tasted better. It inspired a meal I later had with our grandchildren where we talked about how many people, how much work, went into the production and transportation of each item at the table. It was a true “mindfulness” practice, just like a Montessori study of the inter-relatedness of everything. Also, just as in a Montessori class the food is placed in serving dishes – not on individual plates. This way each person, even the youngest child, is free to take what, and how much, his body wants or needs. This is so much better than being given a plate full of food that someone else has prepared; someone else deciding what and how much a person should eat at any one meal. Who but each of us knows, with internal guidance, what and how much to eat. Not only does a child feel good to have his choice of what and to much respected, but he learns, at an early age, how not to waste food. All of us then can take just a small amount and when that is finished to take more if we are really hungry. This is just another Montessori home/school principle with historical/cultural roots. 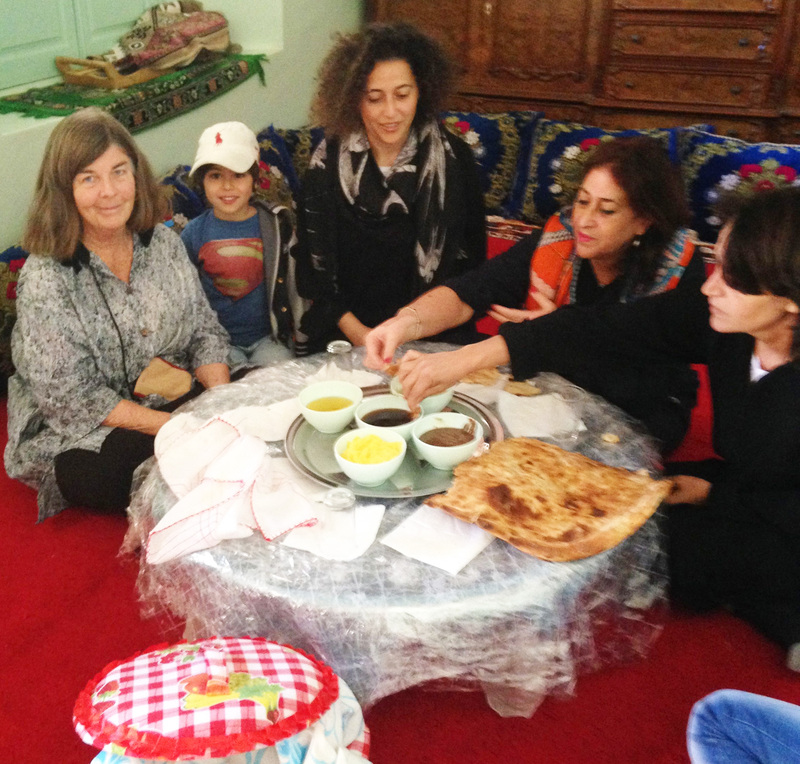 Moroccan Food is world famous – Who knew? 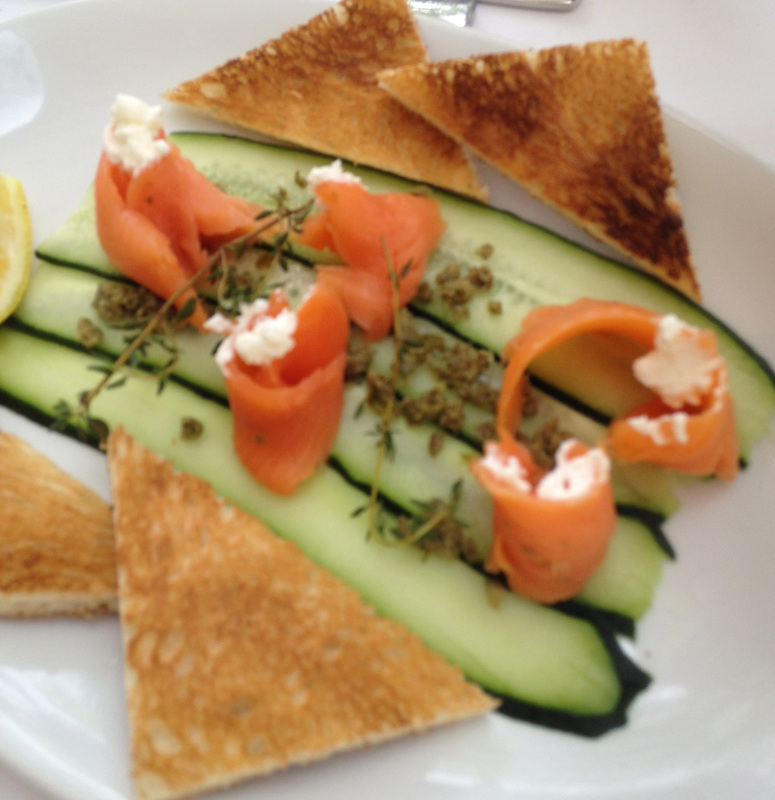 Of course the exception is eating in restaurants – and one can find the most delicious meals everywhere in this country. The first thing I did when returning home was to order a Moroccan cookbook with beautiful pictures. 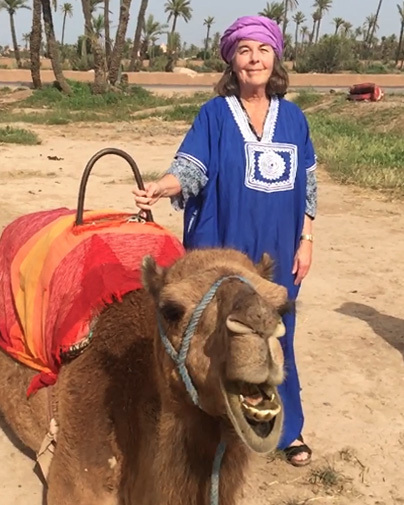 I had no idea that Moroccan cooking was so world-famous! Here is the school where I helped out. Children, from Montessori infant community through elementary (6-12) classes, learn in English, French, and Arabic. There are families from all over the world, all religions, all cultures, all welcome. 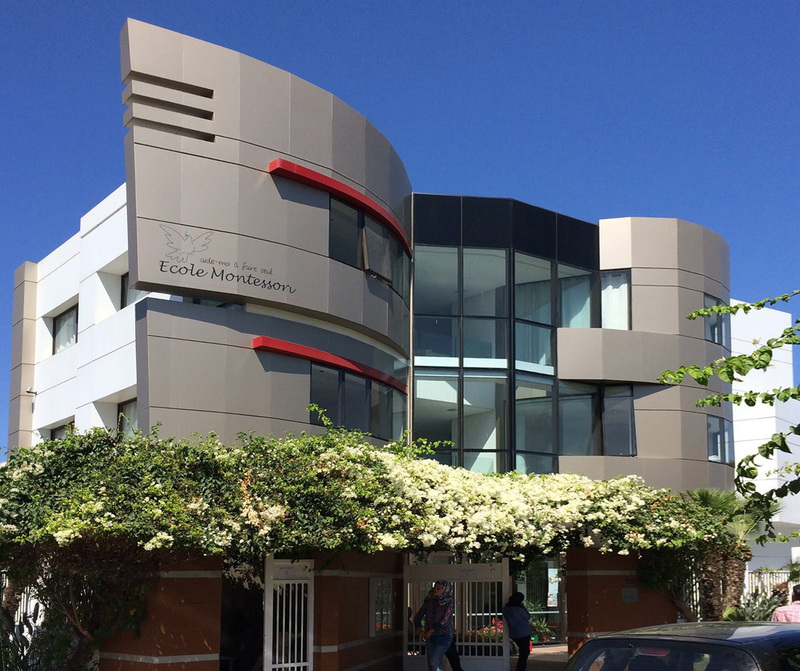 The school is growing and becoming a model Montessori school for the country, indeed for this part of the world. While I was there we began a Montessori program for children from birth-3 in a local orphanage. I will post about this later. In January, 2016 there will be an opening for an AMI Montessori teacher at the 3-6 level and maybe the 6-12 level. Here is the contact information. Please share this blog post with any AMI teacher you know who is ready for an amazing experience. 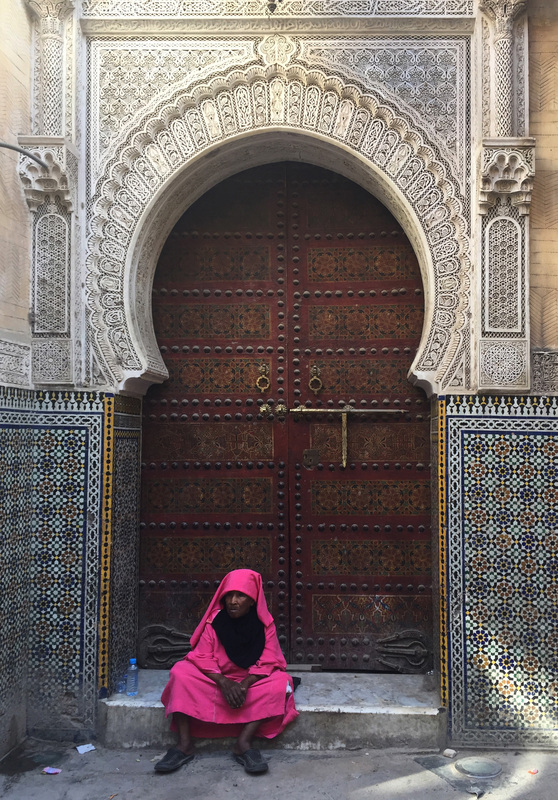 In this video clip that I took in the Fez medina you can hear one of the daily five “calls to prayer”. Sometimes it is hard to come home and hear all the “anti-other” religious views on the main-stream media. Every religion has its crazies (remember the Spanish Inquisition? the partition of India struggles? the church bombings in the USA?). Every religion and philosophy also has its saints, and those of us who are just inspired to do better each day because of spiritual models. While in Morocco I was surrounded by people who respect all religions and focus on being better people and helping the poor. People like this, for whom religion is their inspiration and hope, and their path to help society and the world, exist in all countries. I am sharing it because the song “In Your Name” expresses something I think about all the time. Something that gives meaning to the overriding principle of my life. That it is the idea that it is only through the education of the very young that we can help the world to become a better place.